2017 POC Skull Orbic Comp Helmet. The POC Skull Orbic Comp is the top of the line race helmet specifically and uniquely designed to meet the demands that come with higher speeds, more violet impacts and the constant impacts caused by hitting gates. Along with all of their other award winning helmets, the Orbic Comp is approved according to the FIS RH 2013 rule making this helmet ready for any FIS level competition you may be racing in. The Skull Orbic Comp is loaded with safety features to keep you and your brain safe from violent impacts including the layer of VPD compound in the front for maximum protection through repeated impacts. 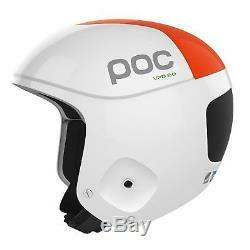 POC uses the APB barrier in the front of the helmet. Also known as APB, the barrier increases the penetration protection for better results from a violent impact. The Skull Orbic Comp also includes a multi-impact EPP liner for maximum protection through multiple intense impacts. 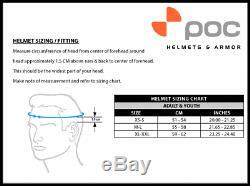 The Comp's liner is easily removable and machine washable to keep the funk out of your helmet and off of your head, keeping you comfortable all day long. The POC Skull Orbic Comp includes multiple removable liners that are to pinpoint the most accurate fit and specially designed ear liners for less effect on hearing. The POC Skull Orbic Comp is the top of the line race helmet to keep your head safe and comfortable from training to the competition. 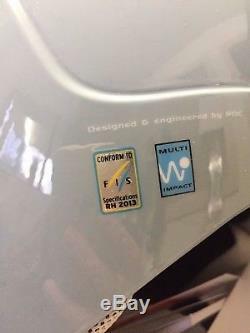 Approved according to the FIS RH 2013 rule. High performance PC/ABS outer shell. VPD front layer for maximum protection against repeated impacts. Aramid Penetration Barrier (APB) in front area. Ear chambers designed for less effect on hearing. Easily detachable liners for cleaning. Two interchangeable linings for size adjustment. Feedback without first contacting us. Its impossible to address an issue if we do not know about them! Please give us 24 hours to respond with a resolution. Most questions can be answered by thoroughly reading the entire listing. 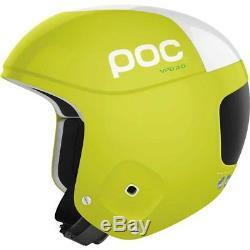 The item "POC Skull Orbic Comp Helmet Ski Race Protection FIS White or Yellow 10145" is in sale since Thursday, March 22, 2018. This item is in the category "Sporting Goods\Winter Sports\Clothing\Protective Gear". The seller is "pinnacleskisports" and is located in Stowe, Vermont. This item can be shipped worldwide.